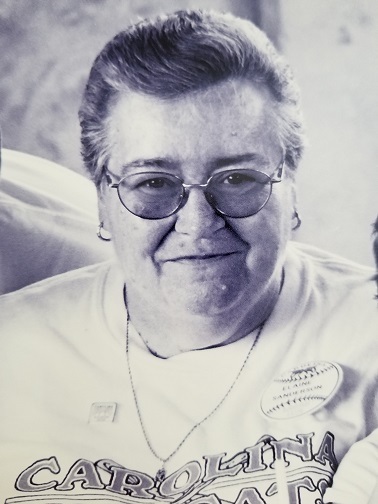 Anna Elaine Gardner Sanderson, 70, died Saturday, March 30, 2019. She was born in Halifax County to the late James Fred & Annie Lucille Beaman Gardner. She was a nurse at Dorthea Dix Hospital for many years as well as caring for people in other care homes. She had a big smile and loved sports of all kind, especially the Mudcats. She was preceded in death by her husband of 38 years, Roy Ray Sanderson, Sr.
She is survived by her children, James Goodwin (Danyelle) of Louisburg, Andrew Sanderson of Angier, Amanda Krogh (Richard) of Zebulon, Roy Ray Sanders (Angela) of Zebulon, Daphne Sanders of Spring Hope, brother, Stewart Gardner of Enfield, 10 grandchildren & many great grandchildren. Good bye my dear friend, I will always treasure the times we shared laughing, singing and cutting up! I loved to see how your eyes would light up when the 2 boys would come to see you and how their antics tickled you real good. Rest now, the struggle is over. See you and Ray on the other side.